Scopri Parigi dopo il tramonto e scopri cosa rende la città delle luci più luminosa, mentre i monumenti più importanti della città e la Senna illuminano la notte. Goditi un pasto gourmet di 3 portate e assorbi le viste panoramiche della 58 Tour Eiffel al primo piano della Torre Eiffel o di Les Ombres. Quindi, salite a bordo di una barca con il vetro e navigate lungo la Senna per fare un giro turistico dopo il tramonto. Questo pasto gourmet di tre portate all'interno del ristorante panoramico della Torre Eiffel comprende una crociera fluviale di un'ora di Parigi di notte. Scegli tra due punti ristoro, vestitevi e dirigetevi verso il centro di Parigi per incontrare il vostro autista. Scivola tra i viali mentre il tuo autista ti porta alla Torre Eiffel con stile. Se hai selezionato 58 Tour Eiffel, sali sull'ascensore e sali al primo piano della torre, dove sarai accolto con viste su Les Invalides, Montmartre, il Sacre Coeur e la Torre di Montparnasse. Se Les Ombres fosse la tua scelta, prendi i tuoi posti e ammira le viste sulla scintillante Torre Eiffel. Assaporare un'esperienza gastronomica da 3 portate prima di fare una breve passeggiata sulle rive della Senna. Qui, salite a bordo di una barca con il vetro e partite per una crociera sul fiume. Mantieni la fotocamera pronta e utilizza il commento audio, mentre navighi per luoghi come la cattedrale di Notre Dame, il Louvre e il museo d'Orsay. 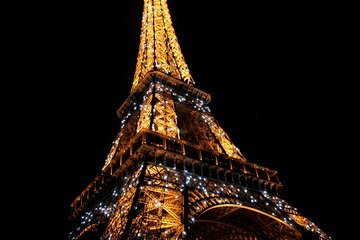 Alla fine della tua crociera, ritorna alla base della Torre Eiffel, dove termina il tuo tour. This was a complete failure. The dinner was at 8 pm however, did not note that we had to meet at 6. We were late from a previous outing called Viator asking if we could please change to the next day but they refused. I am out of $490. I probably would have done better using my concierge than Viator. Absolutely loved the restaurant and atmosphere. Service was great. Like most fancy restaurants, the portions were minimal, figured that would happen so we ate a bit beforehand. The only problem was that we were told that we can go to the second floor to see the view, but we had to take the stairs instead of the elevator. To take the elevator up, you had to go to the first floor and pay extra. As a trainer, I didn’t mind the challenge (it was 300 meters and took around three minutes, and it was cold!!) but we should be able to take the elevator. The cruise was nice. I would do it again!! Concernant le dîner, serveur très attentionné, service impeccable. point "horaire" qui vraiment est loin d'être précis !! When I booked tickets it stated 6.30pm meal, I didn’t receive an email advising it had been changed to 6pm! There wasn’t a seperate queue for the restaurant so we stood in line for the lift for an hour therefore we were late for our meal! Information states wear formal attire, but that is not true, obviously if you want to dress nice and smart you can but a nice pair of jeans and smart shoes is enough as there were other people there in trainers - tuxedo is not required! Meal was nice (but small) I could have ate it 3 times over :-)Views were good - if you get a good table. Staff were very friendly.Make sure you take warm clothes and hat and scarf for cruise if there in the winter if you sit upstairs as it was bitter cold but sights were nice. We found this tour to be over priced for what we actually received. In hindsight we should have done the river cruise during the day and planned our own dining experience at the Eiffel Tower.It was not a very small, intimate experience as I originally thought. Staff very attentive and hospitable you are immediately greeted and ushered to your table. Food and wine is good. We have a good view of the Seine river below. Dinner at Eiffel tower is such an amazing experience and I have the opportunity to look up at the incredible lighted tower with the cruise after. Perfect experience! Dinner was great. The river cruise was amazing. It gets chilly on the water so dress warm. Highly recommended. Was left stranded in the meeting point with no one attending and meeting us. There was no dinner and cruise at all. The agency didn't provide any details at all.